Many information technology initiatives have emerged in recent years with the aim of improving natural resource management. These take a variety of technological forms designed either to directly curb corruption in resource extraction and production, or to enhance information flows, facilitate citizen participation, and hold specific actors accountable. Donors can play a role in connecting the divide between development practitioners, technologists, and researchers by supporting the use of tools in programs and evaluations. We cannot ignore the potential for Facebook, Twitter, Google Maps or Instagram to benefit resource management. Their widespread use makes them a potential power for efficient campaigns. We have created a database of technological initiatives relevant for natural resource management. It has almost 400 examples of projects, organisations, and tools that apply technological innovations. Use of technologies are often successful when combined with existing social structures like farmers-organisations, youth groups or online communities. Donors can help connect the divide between development practitioners, technologists, and researchers by supporting the development and use of tools in programmes and evaluations. ...technology-facilitated information flows and participatory mechanisms can help to ensure that oil and mining revenues are spent for public rather than private interests. We created a database 0db22c4e5567 of existing technological initiatives relevant for natural resource management. It contains nearly 400 entries encompassing a wide and representative range of projects, organisations, and tools that rely on technological forms to operate. These initiatives are either focused directly on a particular resource, or they could be used in anti-corruption efforts within a resource sector due to their broadly applicable nature. They range from high-end surveillance and monitoring applications used by governments and large corporations worldwide, to free and open tools commonly used by activists and NGOs. Most of the initiatives exist in the form of ‘freemium’ software, which is free of charge at a basic level, but offers premium features with expanded functionality for a fee. To build this database, we relied on on crowd-sourced support generated through the NGO Standby Task Force. Information on organisations whose work depends on technological innovations. As customised technological initiatives have been developed for various purposes in these fields, many profit- and non-profit organisations have emerged around them. The projects that the listed organisations work on are typically collaborations between traditional development organisations and small, specialised organisations. Data on a wide spectrum of technology applications used for communication, management, surveillance, or visualisation of information. Some of these are free and several have been rapidly adopted by millions of people. References to literature and research reports as well as links to resources collected either by organisations, companies or through crowd-sourcing for the purpose of skills- and knowledge sharing. The database lists 93 tools; 102 projects where technological tools play a major role; 98 organisations using technological tools, either for profit or non-profit purposes; and 73 resources and references. Each section contains more detailed categories of information. We note two trends of interest in the development of these technological initiatives. 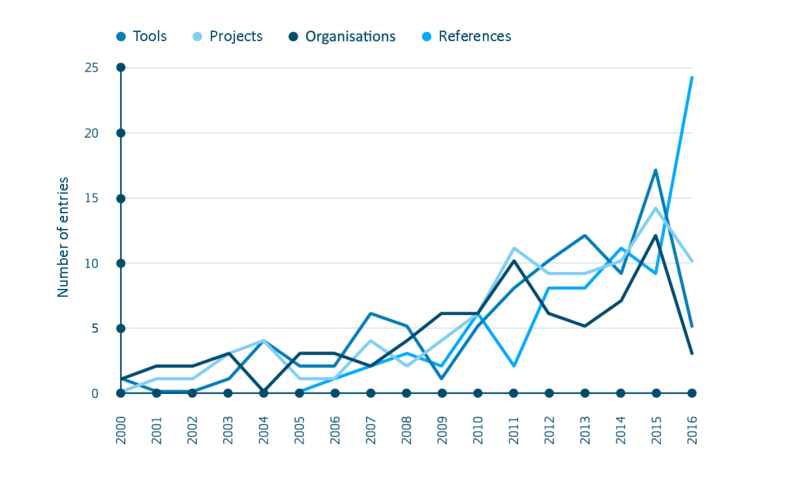 The first is a temporal trend, as depicted in Figure 1: most of the initiatives are recent creations, with the majority emerging after 2010. Nearly three-quarters (72%) of the projects in the collection were launched less than six years ago. In general, the use of digital technology in natural resource management is a new phenomenon, one that is clearly on the rise, but we can also further disaggregate among the trends. As seen in Figure 1, while there has been a significant, steady linear increase in each of the four sections of the dataset, the numbers of tools and references have grown most since 2012 – evidence of both the rapid spread of technology as well as interest in its manifestations and effects. A second clear trend is that once a tool or project goes online, it usually supports simultaneous collaboration across technological solutions, given that cloud storage and global access to information have become the norm. A modern tool generally has interfaces for desktop access, online browsing and mobile-operation. This means that the field worker can access the same information as at the home office, even if it is over a slow connection, thus enhancing the potential of technology to reduce corruption in resource management projects and programmes. This flexibility also enhances the ability of ordinary citizens to use tools. Figure 1: Time trends in technological innovations. The data was collected in June 2016. The number of entries for tools, projects, organisations and references created in 2016 therefore covers only the first six months of the year. Below, we describe five examples of projects, organisations, and tools that have successfully employed technology for anti-corruption purposes related to natural resource management. Knowing whether anti-corruption programmes are achieving their goals can be a major challenge in the absence of uniform standards and indicators to monitor and evaluate progress. Miradi – a Swahili term for project or goal – is a digital project management tool that assists organisations to plan conservation projects according to a set of open, international standards. The aim is to provide a unified, consistent way to measure the effectiveness of organisational programmes. These standards are known as the Conservation Measurement Partnership’s Open Standards for the Practice of Conservation. Inspired by the tax preparation software TurboTax, Miradi works by guiding the user through a series of questions, the answers to which are used to create project management, monitoring, and implementation plans that adhere to the Open Standards. Thousands of conservation projects around the world operate according to these standards, wherein testing assumptions by collecting monitoring data may lead to adaptation of these assumptions (so-called adaptive management). Adherence to a set of uniform standards makes it much easier to track progress on anti-corruption programmes in resource sectors, and to ensure that corruption does not impact conservation programmes. The Miradi website also features a community library, where key information about a select number of ongoing projects are published. Adherence to uniform standards makes it easier to track progress on anti-corruption programmes in resource sectors, and limit negative impact due to corruption. Poaching and the trafficking of endangered plant and animal species are directly facilitated by corruption. To help combat this problem, the Elephant Action League created WildLeaks, an anonymised reporting mechanism for wildlife and forest crimes. Reports are used to start investigations into these crimes, and once information is reviewed internally, it is passed on to NGOs, the media, and law enforcement agencies to take concrete action to stop these crimes. Unlike other “leaks”-organisations, information is never simply dumped into the public domain. Anonymous posts to WildLeaks are transmitted through the Tor-platform, a web-system designed to allow for anonymous, non-trackable connections. Alternatively, anonymous, encrypted messages can also be submitted through the Threema mobile application or through encrypted email. The design of the WildLeaks platform allows for non-technical individuals to submit material. However, successfully using technology to reduce corruption in natural resource management is not without its challenges. First of all, information does not automatically translate into accountability; rather, people must be able to take action on the information that they receive. Moreover, some may claim that information technology enables criminal and unethical behaviour faster than authorities are able to follow. Second, context matters in why some digital initiatives are more successful than others. A significant number of the projects identified in the dataset describe situations where a number of technologies are successfully implemented because they have been combined with existing social structures like farmers-organisations, youth groups or online communities to achieve their goals. As natural resources has a physical and geographical component to it, projects combining digital tools, social organisations, and incentive systems may have the best potential for achieving their goals. Third, social norms about the appropriateness of certain technological forms, as well as sustainable financing, are important for initiative success and survival. Finally, take-up of technological initiatives depends heavily on their financial cost and the degree to which specialized knowledge is required to use them. ...donors can enhance the legitimacy and social acceptance of technology, and work differently to mitigate and prevent corruption in natural resource management. Donors can play a role in connecting the divide between development practitioners, technologists, and researchers by supporting the development and use of tools in programmes and evaluations. Support can come in the form of developing initiatives themselves, funding existing or start-up initiatives, or through supporting and involving in programming the networked technology hubs that are emerging all over the developing world. These hubs consist of spaces where local entrepreneurs gather to get access to tools, share knowledge and develop projects; they represent local nodes with access to global networks of technological competences and experiences. By strengthening local relationships and knowledge generation, donors can enhance the legitimacy and social acceptance of technology, and work differently to mitigate and prevent corruption in natural resource management. This database was available online until the hosting service shut down in December 2017. We aim to reestablish access to it for all readers.